This post has been sponsored by Tyson Foods Inc. All thoughts and opinions are my own. Serve up this classic southern buttermilk cornbread with a twist. It’s made with freshly grated cheddar cheese, jalapenos, savory bits of Sara Lee® Honey Ham, honey, and other classic ingredients. Everyone will love this wholesome cornbread a sweet honey and jalapeno glaze. Once you try this easy side dish, you’ll never make it another way again. Buttermilk Cornbread is the ultimate Southern dish. Cornbread is a beloved Southern staple and it’s served all throughout Louisiana. It’s an especially popular quick bread dish to present during the holiday season and it has grown to be one of my favorite recipes to make this time of year. When I think of Thanksgiving, turkey and cornbread are the first things that come to mind. I mean, who doesn’t love cornbread? It’s such a beloved side dish during the holidays. Since the holiday season is a busy time of year that includes office parties, potlucks, holiday cocktail parties, Thanksgiving, and Christmas, I wanted to make a savory cornbread that rivals the sweet version this time of year. 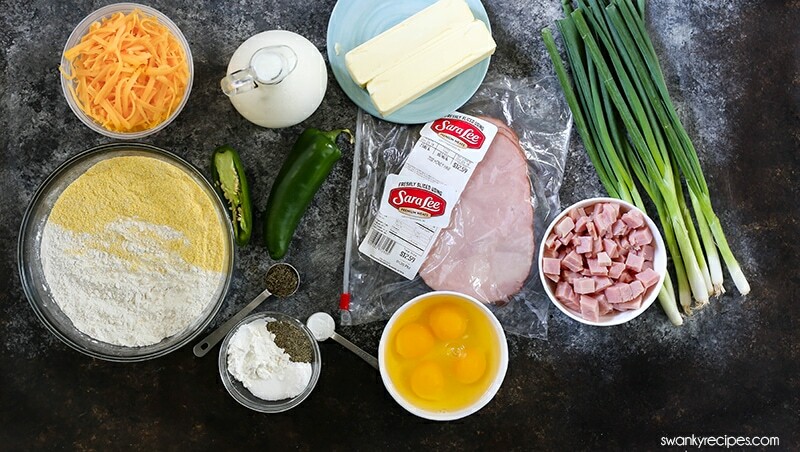 This cornbread includes diced honey ham, cheddar cheese, jalapenos, and warm spices and herbs like thyme, onion powder, and garlic powder. To take it to the next level, I’ve topped this easy potluck casserole with a sweet heat glaze made of honey and jalapenos. A simple glaze elevates this dish and the honey truly adds flavor tones to the savory component of the cornbread since jalapenos are a main ingredient in the cornbread recipe. Cornbread is a southern staple and it’s served nearly everywhere. If there is one thing I love about the south, it’s the comfort food and the fact that I can find this side dish nearly anywhere and everyone loves it. Homemade cornbread is so good and worth the effort. You’ll never go back to using store-bought version again. Sara Lee® Honey Ham is my go-to deli meat behind the deli counter. 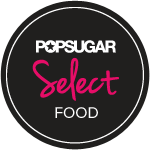 In fact, you’ll find a variety of their premium, high-quality cut of meats have a delicious fresh taste. 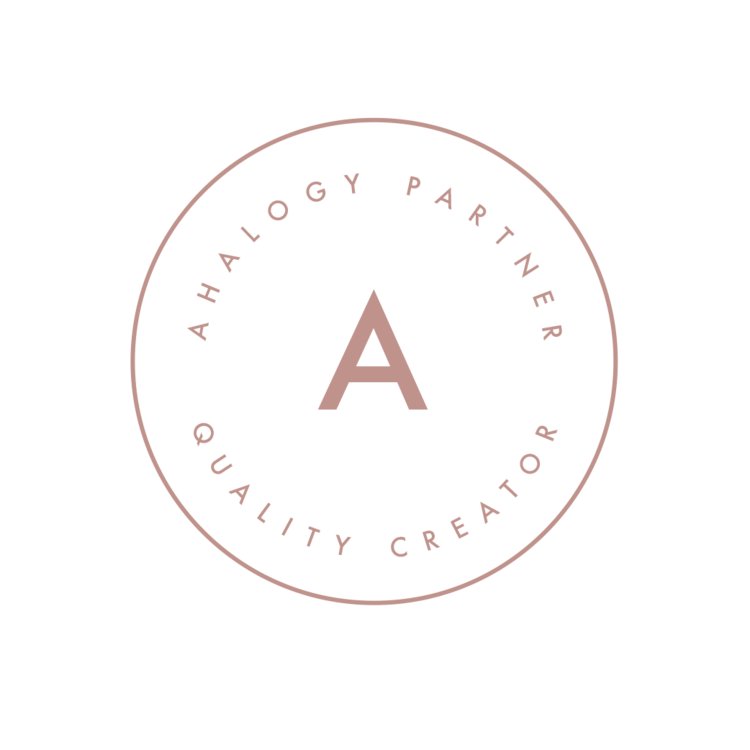 I always pick up a few freshly sliced, affordable, and premium quality flavors to include in a holiday spread throughout the season. 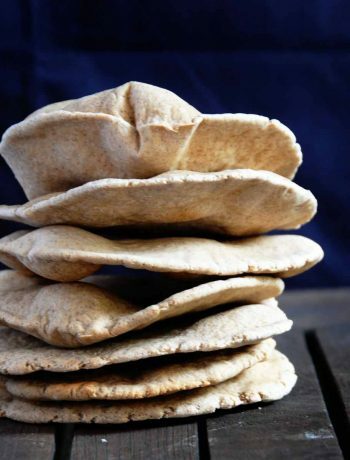 Plus, everything for this recipe can be purchased in one stop from your local grocer, which makes it super convenient to grab the ingredients on your way home from running errands. Friends always ask me for recipes that they can bring to a party. Everyone I know appreciates that this buttermilk cornbread recipe is incredibly easy and convenient to make on a busy weeknight. As a quick bread, this recipe comes together in 15 minutes and requires just 40 minutes to bake in the oven. It can be made in advance and transported to an office party or holiday dinner across town. Everyone raves how delicious this Cheddar Cornbread is. By the end of the party, there won’t be any leftovers. 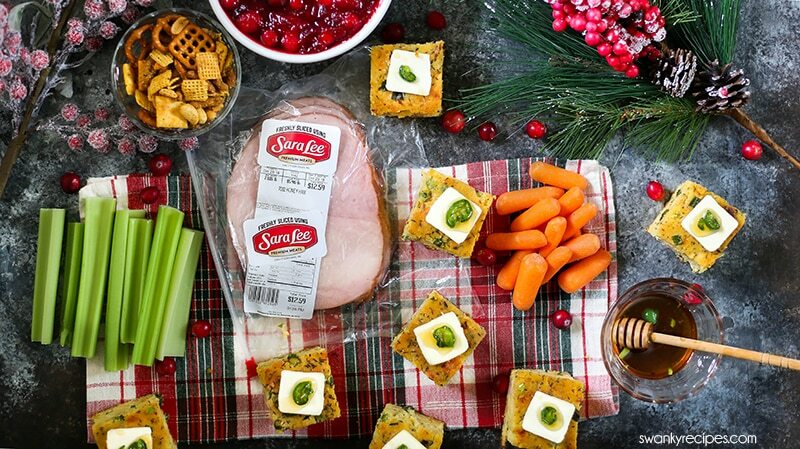 For a quick holiday spread using Sara Lee® Deli Meats, I like to make this cheddar cornbread. 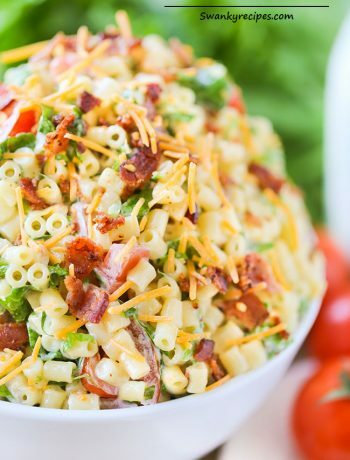 Other quick recipes that incorporate Sara Lee® Deli Meats include a giant cheese ball with ham, turkey mac and cheese, southern cornbread dressing with diced ham, Ham and Cheese Pinwheels, and a charcuterie platter featuring a variety of trending Sara Lee® Deli Meats favors and cheeses. 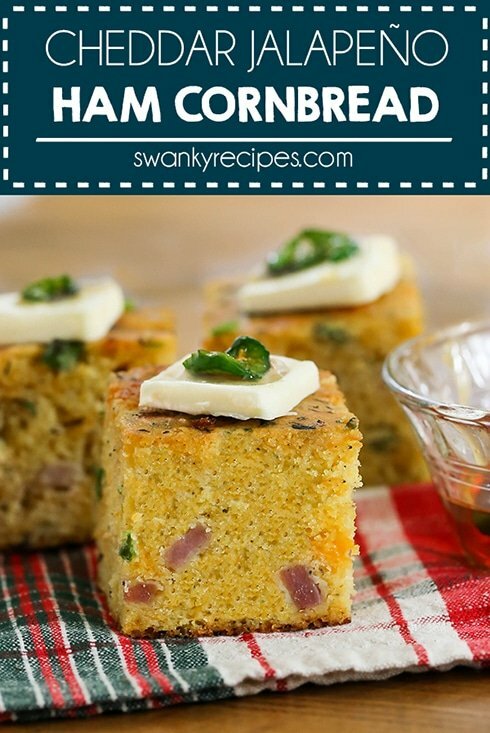 For a taste of the holiday season, try my savory Cheddar Jalapeno Ham Cornbread. It’s made with a honey jalapeno glaze and that will rival any ordinary cornbread recipe brought to the table. Featuring both sweet and savory components, this cornbread is top notch for the holiday season. If you love easy potluck casserole dishes, you’ll want to make this recipe and share it with your friends and family. For delicious recipes, your whole family will love, how-to videos, meal hacks and more, and easy recipe solutions, visit the Sara Lee® Premium Meats website! 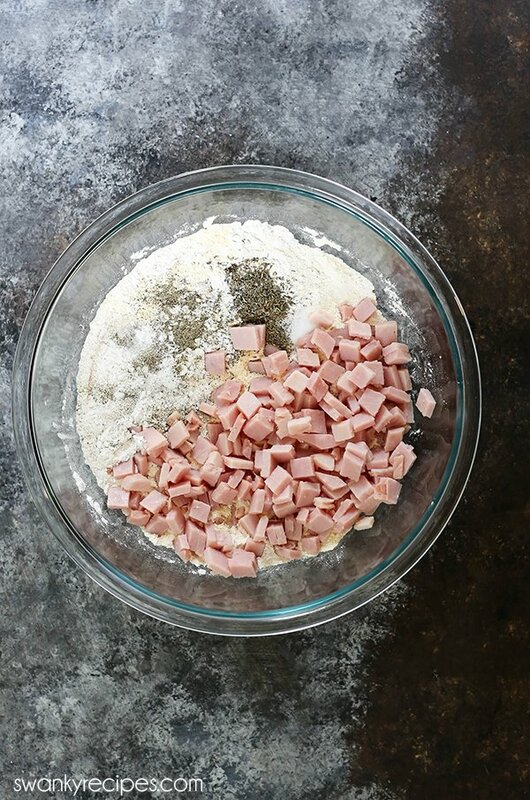 Serve up this savory Cheddar Jalapeno Ham Cornbread for the holiday season. An easy homemade buttermilk cornbread recipe that everyone loves! Preheat oven to 370 degrees F. Grease a 9 x 13-inch casserole dish with foil. Spray with cooking spray or butter; set aside. In a large bowl, combine cornmeal, all-purpose flour, salt, baking soda, baking powder, cornstarch, garlic powder, onion powder, and thyme. Whisk together then add in diced Sara Lee® Honey Ham and coat well. In a medium bowl, whisk eggs. Add in granulated sugar, honey, buttermilk, diced jalapenos, and diced green onions. Mix in melted butter. Whisk to combine. Stir in grated cheddar cheese. Slowly pour wet ingredients into dry ingredients, a little at a time, folding batter to incorporate. Repeat until all the wet ingredients are incorporated into the dry mixture. Pour into prepared casserole dish. Garnish top with any extra green onions and dried thyme, optional. Bake in oven 40-50 minutes. Top should be golden brown and center should be set. Insert a toothpick into the center. If batter is wet, continue to bake at 5 minute intervals. If top gets too dark, cover with foil. Mine took 45 minutes to bake. Allow to cool. Pull cornbread out by foil. Remove foil. To make the glaze, in the small bowl, combine honey and sliced jalapenos. Microwave for 30 seconds. This will allow the heat in the jalapenos to spice the honey. Glaze cornbread with hot honey then cut into 35 squares. How it would be nice on a holiday table! 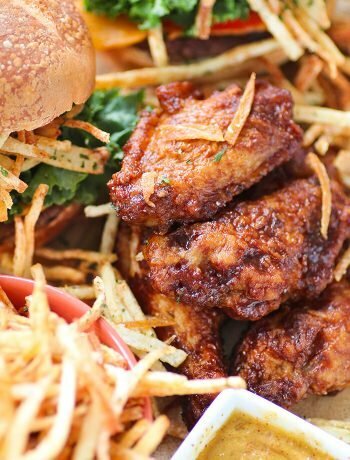 Beautiful flavors and pretty to wow guests! 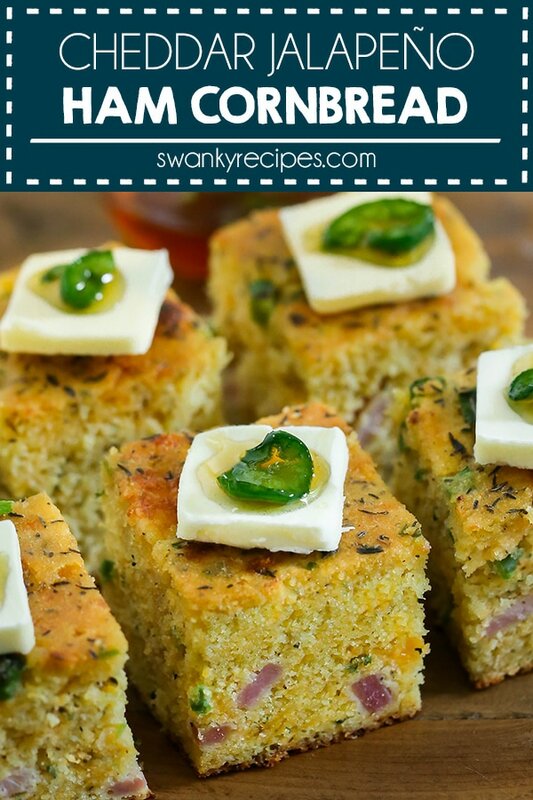 Love cornbread and this is such a treat with cheddar, jalapeno, and ham in there. Sounds so good. Can’t wait to try this. I am down for anything cornbread, but this cornbread looks like it could be a meal in itself! Yes, please! Ooooo such a lovely flavour combination! This cornbread looks ultra yummy, perfect for any big family dinner or to pair with a big ol’ bowl of chili. 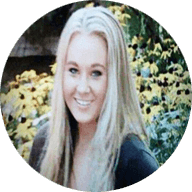 Your directions are super easy to follow, thanks for sharing! I love cornbread because it’s perfect as a side dish but you can also have it for breakfast. This cornbread certainly fits both of those. Especially with a yolky egg! 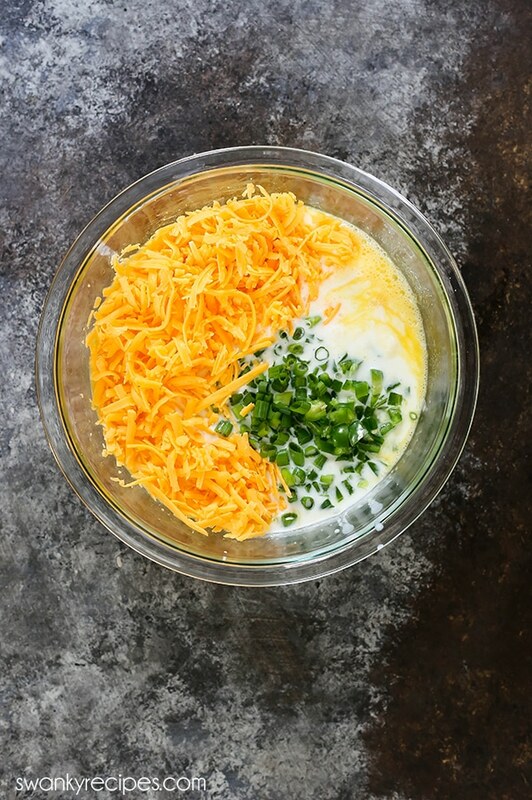 Love the combination of spicy, cheesy, and savory! Cornbread isn’t a thing in Canada, so I have never actually tried it. But I am blown away with all the combos you can do! This looks so good!! Oh wow, I’ve never seen cornbread with ham inside, what a genius idea! And I love the flavor of honey ham…I use it all the time. Jalapeno adds such a nice kick to the cornbread, and this would be perfect for all kinds of entertaining. What a lovely combination of ingredients here. I can’t wait to try this bread recipe. YUm YUM! Yum!! I am loving all the flavour combos in this cornbread!! I have only tried plain cornbread, so I can only imagine how much better this version is! Love that you have added a little kick to this! I would have to add extra jalapenos, because I can never have enough.